Topps has locked up a multi-year deal with Yu Darvish that gives the card maker exclusive rights to autographed trading cards of the Japanese pitcher. Collectors won't have to wait long for the first chance at getting the Rangers' signature. Twenty-five redemption cards are scheduled to be included in the soon-to-be-released 2012 Topps Tribute. 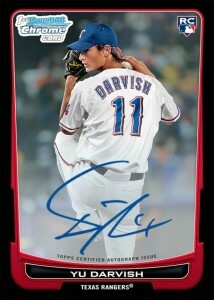 Topps also announced 25 Darvish autographs in 2012 Topps Gypsy Queen and 30 signatures in 2012 Topps Museum Collection. 2012 Bowman Baseball will have autographed Bowman Chrome rookie cards. Topps will continue to bring the 25-year old's signature to sets throughout the season, including 2012 Topps Allen & Ginter, 2012 Topps Archives, 2012 Topps Series 2 Baseball, 2012 Topps Chrome Baseball and more. The deal also allows Topps to make memorabilia, base and insert cards of Darvish. Before signing with the Rangers, Darvish autographs were tough to come by. This should certainly open up the market somewhat. It will definitely up the value for the product he appears in. Click here for a complete checklist of 2009 Topps World Baseball Classic Yu Darvish cards. In the Japanese Pacific League, Darvish was a strikeout machine, leading the league three times. He was also a two-time MVP.